Once home to Melbourne Cup winner Makybe Diva, the property formerly owned by renowned horse trainers the Freedman brothers has been converted into a brewery. Andrew Purchase and Michael Freeman (correct spelling – no relation) have opened St Andrews Beach Brewery on the 92-acre Mornington Peninsula, Victoria property known as Markdel at Fingal, which they acquired from the racing family two years ago. Son Tim Purchase, who is business development manager for the project, told Brews News the venue consists of a 180-capacity brewpub, with the 1200 metre racetrack to be converted into an apple and pear orchid. The company is planting 8000 trees with the goal of producing their own range of ciders. “Using the existing infrastructure we have turned all the old horse boxes to sitting areas, and we’ve gutted the middle of the training facility and built our cellar door and brewery and kitchen,” said Purchase. 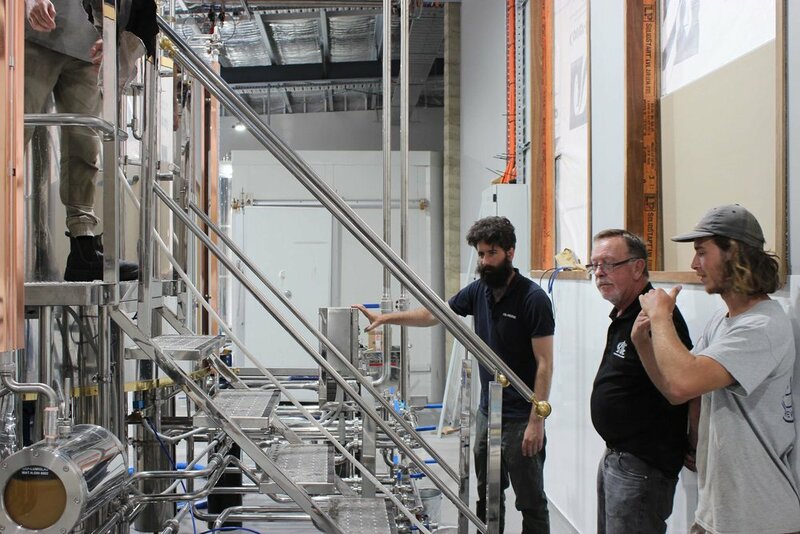 St Andrews has installed a 25 hectolitre brewhouse supplied by FB*PROPAK along with a 50hL hot liquor tank, a 50hL cold liquor tank, 4/4/1 automatic bottle rinser, automatic labeller, bright tanks, uni fermentation tanks, keg washer/filler, CIP plant, malt mill, filtration and packing tables. Cellar capacity comprises two 25hL uni fermentation tanks, four 50hL uni fermentation tanks, one 25hL bright beer tank and a 50hL bright beer tank. Veteran brewer Dermot O’Donnell, who recently celebrated 50 years in the beer industry, consulted to St Andrews as master brewer, developing an initial range of beers that includes an American pale ale, a lager, a golden ale and a pilsner. “We want to become a fully integrated and self-sustaining agricultural business, so we also have our own pigs, chicken and sheep, and whatever doesn’t get used in the kitchen goes to feed the animals,” Purchase said. St Andrews Beach Brewery joins Mornington Peninsula Brewery, Red Hill brewery and Jetty Road Brewery in the region. 160 Sandy Rd, Fingal, Victoria.